DeepCool recently started selling the QuadStellar four-lobed chassis on the market nearly a year after it made its debut at CES 2017 in January. 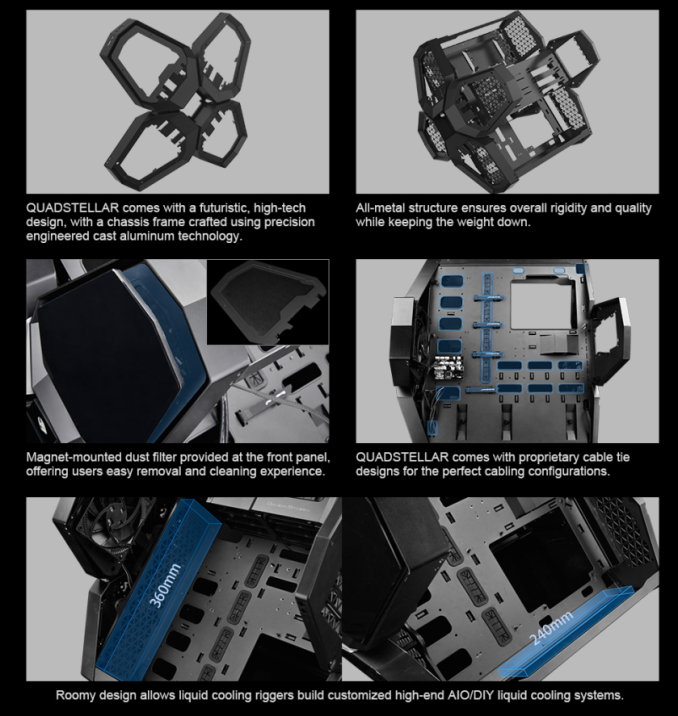 The QuadStellar design follows its predecessor, the TriStellar, with its lobed design looking more like a high-tech black drone than a traditional PC case. The lobes each hold a different heat producing component - for example Storage, Power, and Video cards while the central hub houses the motherboard. 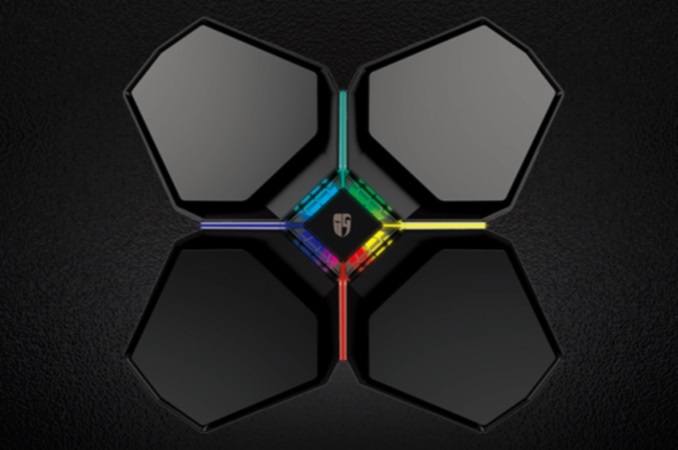 The QuadStellar integrates a tasteful RGB LED design on the front of the case; a line between the lobes which connect to a hub of other LEDs. 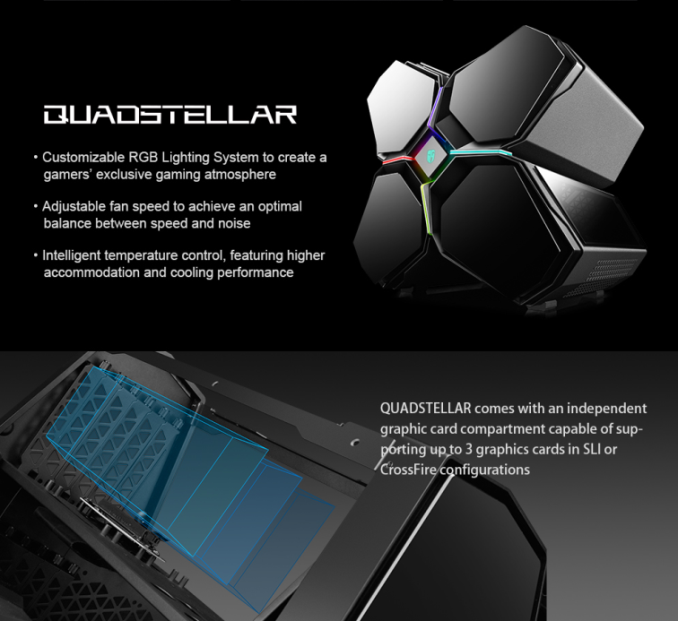 Deep Cool is marketing the Quadstellar as the world's first smart PC case as the RGB lighting, as well as fans/thermals, are controlled by the QuadStellar App. It is a unique looking case with what looks like plenty of internal design flexibility as well as a unique exterior. The chassis is crafted using cast aluminum to ensure rigidity and quality while trying to keep the weight down. The exterior uses a combination of aluminum and the magnet mounted tempered glass. Also, magnet-mounted dust filter at the front panel to keep the making those easier to remove and clean. The front of the chassis contains the front panel IO consisting of two USB 3.0 ports, microphone and headphone jacks, as well as the power and reset buttons. Meanwhile, the back panels have triangular vents for air to flow through in a front to back configuration. Inside the main chassis, there is room for up to sized E-ATX motherboards with a maximum length of 330mm down the ladder to Micro-ITX. The QaudStellar supports two radiators; the front mount up to 3x120mm and up to 2x120mm on the bottom. If air cooling is the method of choice, the maximum cooler height is 110mm which will eliminate a few of the larger choices available on the market. The expansive sections do yield a lot of freedom in motherboard choices as well as options for air, custom water cooling, or AIO/CLCs. Unique to the QuadStellar is a proprietary cable tie design in order to keep the cables well hidden. They are routed through a choice of several holes, most of which have grommets, to route the cables out of the way. The GPU lobe is able to hold up to three full-sized cards to 380mm length maximum for SLI or Crossfire setups. If housed in the lobe, they are connected to the motherboard via riser cards. Otherwise, up to Quad-SLI/Crossfire can fit in the main section. The storage compartment is equipped with eight 3.5-inch and two 2.5-inch drive bays with an additional three 2.5-inch bays inside the case. Many will run out of motherboard SATA ports before the drive bays are all occupied. The power supply is also housed in an independent lobe and is able to fit longer ATX power supplies, up to 300mm in length. Being in its own lobe also gives the benefit of seeing fewer wires in the main chamber. For cooling, the QuadStellar includes five pre-installed 120mm fans, four located on the front and one at the back, for cooling all the parts inside. There are additional spaces for two more fans on the front (totaling six), and two on the sides. The fans all plug into an included hub mounted on the back of the motherboard panel and can be controlled through the App. DeepCool stated the MSRP price in the US will be $399 and will launch globally at the end of December. The images here do a terrible job of showing how it all goes together and what goes where. But from the listed sections I see two possible layouts. 1) Mobo compartment taking two of the points and the center. GPU compartment in a 3rd point, Drives and PSU splitting the 4th point in two. 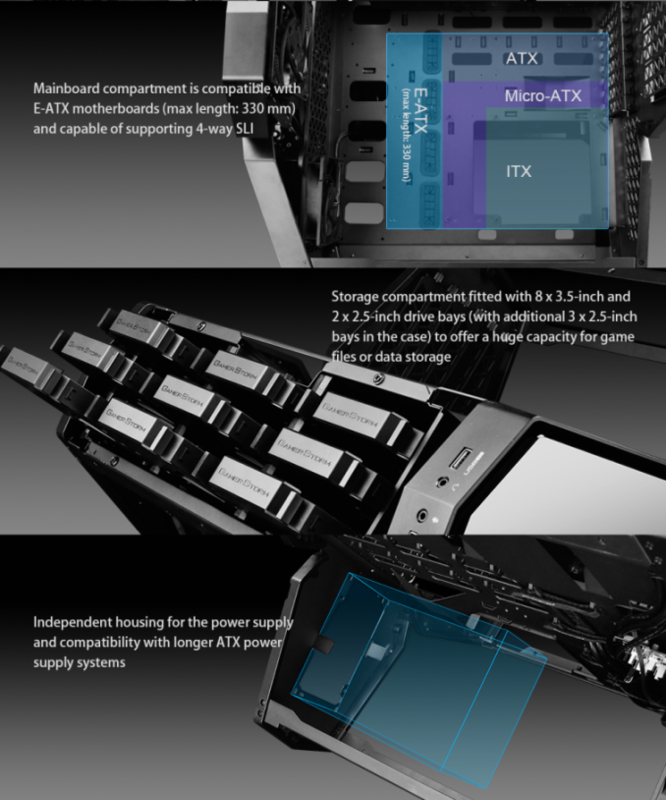 2) Mobo taking one point and the center, GPU the 2nd point, Drives the 3rd, and PSU the 4th.